In this wide-ranging interview, Fool contributor Brian Feroldi chats with CEO Michael Minogue about the medical device company's competitive landscape, growth potential, valuation, and more. Few stocks can match the returns that Abiomed (NASDAQ:ABMD) has put up in recent years. Investors who bought the medical device maker's stock a half-decade ago have been treated to a gain of more than 1,500%. That incredible run could have transformed a modest investment into life-changing wealth. So what's driving Abiomed's success? And -- more important for investors today -- could there be more gas left in the tank? To find out, I visited the company's headquarters for an exclusive interview with management. Below are a few highlights from our chats. (Quotes have been lightly edited for clarity and brevity). Abiomed was founded in 1981 with the bold mission to create the world's first artificial heart. While decades of hard work ultimately resulted in a regulatory thumbs-up for the company's AbioCor artificial heart -- it received FDA approval in 2006 -- the device was a commercial flop because it wore out quickly, and it only provided a modest clinical benefit. Thankfully, the company wound up striking gold when it hired Michael Minogue from GE's healthcare division to take over the top chair in 2004. Minogue worked quickly to shift Abiomed's focus away from devices that replaced the heart, and instead placed its emphasis on those that assisted the heart. He jump-started the transformation by buying a small German company called Impella CardioSystems in 2004 for $45 million. The Impella 2.5 Heart Pump. Image source: Abiomed. Impella CardioSystems' big innovation was to use minimally invasive techniques to temporarily implant a miniaturized pump directly into a patient's heart during surgery. The Impella pump would then help the damaged heart keep the blood flowing, enabling high-risk procedures to be performed more safely and with shorter post-surgery recovery times. Abiomed ultimately succeeded in introducing Impella to market. In the years that followed, the company received regulatory approval for four different Impella pumps for two major cardiac procedures: cardiogenic shock and protected percutaneous coronary intervention (PCI). Fast-forward to today, and it's clear that the acquisition has paid off in spades. Abiomed's revenue, profits, and stock price have all soared as heart surgeons everywhere have come to appreciate the benefits of using Impella during procedures. Here's how Abiomed's business works: A sales rep convinces the key decision makers at a hospital to start using Impella devices. Once they are on board, the hospital orders a few. After surgeries take place, the hospital sends in a reorder. Here's one aspect of the business that particularly impresses me: In roughly 70% of surgeries where an Impella is used, an Abiomed employee is literally standing in the operating room providing support for the product. This helps to ensure that everything goes smoothly, and it deepens the company's relationships with surgical teams. This also helps the company in another way: When the procedure is complete, the rep turns to the doctor and asks if they would like to place a reorder. As you can imagine, the answer is almost always "yes" -- the company boasts a reorder rate of approximately 100%. I asked CEO Minogue to give us a sense of Abiomed's total addressable market (TAM) as it exists today, and how it's evolving over time. Here's what he said. Based on our current FDA indications, Abiomed estimates that there are 121,000 potential patients for the elective and urgent Protected PCI indication and an additional 100,000 patients for the emergent cardiogenic shock indication. We are still in the early innings with a penetration rate of approximately 10% and we believe that Impella adoption is a function of training, data, and time. While that market opportunity is huge, Abiomed isn't resting on its laurels. It's exploring other cardiovascular indications in which surgical patients could benefit from Impella, such as myocarditis, peripartum cardiomyopathy, postpartum cardiomyopathy, and spontaneous coronary artery dissection. Each of these indications could add another 5,000 to 10,000 patients to the company's addressable market each year. Abiomed's pipeline also holds promise, with two devices in development targeting a pair of big markets. The first, the Impella BTR, is designed for use after a particularly serious type of heart attack called ST-Elevation Myocardial Infarction (STEMI). Roughly 200,000 people a year have STEMIs in the U.S. alone, so success here would nearly double the company's current addressable market. Then there's the Impella 5.5, which is designed to address three different classes of nonischemic heart failure. Success with the 5.5 could add another 100,000 patients per year to the mix. The other major lever that Abiomed is pulling to expand its market opportunity is international expansion. The company sells Impella pumps in the U.S. and Germany, and it recently began selling in Japan. While there is significant room for continued growth in all of these countries, the opportunity ahead in Japan looks huge. Japan is the 2nd largest medical device market in the world with ~50,000 patients annually seeking treatment. We think Japan will be a strong market for Impella, because Japanese physicians specifically focus on percutaneous treatment and are very interested in solutions promoting heart recovery. We have a total of 21 sites currently open and are on track to have 45 sites by the end of the fiscal year. Abiomed already has regulatory approval for its devices in India, China, Israel, France, and the U.K., among many other countries, and it intends to expand into those markets as it gets reimbursement set up. Impella heart pumps are the only FDA PMA approved minimally invasive hemodynamic support devices for high risk PCI or cardiogenic shock. We are proud of our position as the inventors and leaders of percutaneous heart pumps. In other words, the company doesn't face any direct competition today. Instead, Abiomed's main competition is an older technology called the inter-aortic balloon pump (IBP). Since an Impella pump costs about $24,000 and an IBP costs about $800, the company faces an uphill battle on the pricing front. Thankfully, those numbers are only a part of the story. Abiomed has the data to show that using Impella leads to overall cost reductions when compared to IBP because it helps patients recover faster and leave the hospital between two and 12 days sooner. Impella also cuts the readmission rate in half. Thus, Abiomed can make a compelling argument to hospitals and insurers that using its devices results in cost savings to the healthcare system. As a longtime investor and admirer of Intuitive Surgical, I'm quite familiar with this variety of economic argument. Intuitive's da Vinci machines require a large up-front investment, but they can be cost-effective in the long run by delivering faster recovery times for patients. Intuitive for many years has successfully used that line of reasoning to combat concerns about its systems' price tags. Regulation: The regulatory pathway requires a PMA approval, which can take years to complete. Abiomed's process took eight years from start to finish. Data: The company's devices have been used on more than 70,000 patients, so Abiomed has a treasure trove of data that proves its technology is safe and clinically effective. Relationships: As previously mentioned, 70% of Impella procedures are supported by an Abiomed employee, which strengthens the company's relationships with healthcare providers. Training: Abiomed has invested heavily in its training infrastructure to ensure that everyone who uses an Impella device has the know-how to ensure that the procedures are done properly. Since the training process can be long, surgeons will likely be hesitant to switch to another device provider. Patents: The company holds several hundred patents, and several hundred more that are pending approval. Real-time support: All of the Impella devices that are in use send back data in real time to Abiomed. This allows the company to provide continuous support for their products. In other words, Abiomed has a substantial moat that would make it extremely difficult for another company to unseat it, even if such a rival managed to bring a competitive product to market. One criterion that I check in any potential investment is the company's culture. I'm a firm believer that a great work culture helps to attract and retain top talent, which is a critical factor in long-term success. Abiomed and Mingoue seem to do a great job on this front. The company receives a strong 3.8 stars out of 5 on Glassdoor, where employees can leave anonymous ratings, and Minogue boasts an approval rating of 88%. Our company culture is driven by our ability to serve our patients. The key to our success and execution has been our four principles and our commitment to putting patients first in everything that we do. Our employees wrote our four principles – recovering hearts, saving lives; leading in technology and innovation; growing shareholder value; and sustaining a winning culture. As Abiomed continues to grow and hire top talent, these principles guide our journey, unite us, and remind us to always put our patients first. 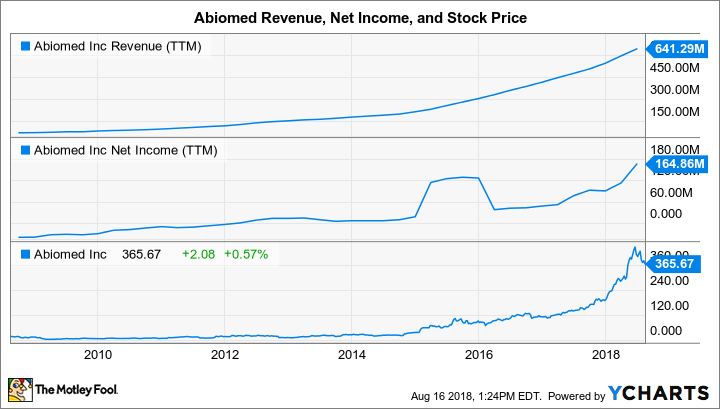 One of the biggest issues for potential Abiomed investors today is that the stock's huge run has given the company some lofty valuation multiples. Shares currently trade for 75 times forward earnings and 25 times sales. Thus, the hardest question is whether it is worth it to pay such a high premium to own the stock. The answer comes down to whether you believe that the company's addressable market and pipeline are large enough to drive double-digit percentage annual revenue and profit growth for the foreseeable future. Given its strong competitive position, sparkling financial statements, and massive runway for growth, I came away from my meeting extremely impressed with the business. Even after factoring in the stock's high valuation, I can't help but feel that investors could do well for themselves by buying shares today. In fact, as soon as the Fool's trading rules allow, I plan to open a starter position in Abiomed myself.